"Nobody bothered them. They ate, they had fun. They danced a little. We have a jukebox in here." Carolyn Washington, manager of the Waffle House at 59th Ave & I-10 in Phoenix. Someone commented on how clean the bathrooms were. They danced a little. 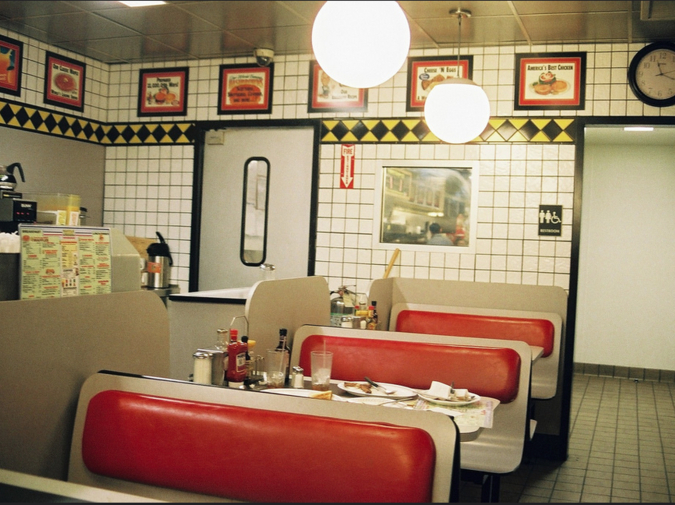 Every Waffle House has a Jukebox. Kanye wouldn't look at Kim. John and Chrissy held hands. John got up and checked if the bathrooms locked from inside. Kim said "isn't there a Pavement album called Smothered Covered something?" Kanye said, "are you speaking English?" John and Chrissy had disappeared. Kim said, "oh Kanye you're so cute when you're hangry." Kim ordered hashbrowns smothered, covered, and capped. Chrissy sat down, wiped her lips, and ordered a Diet Coke. Kim said, "Chrissy isn't Kanye cute when he's hangry?" Kanye sank into a thousand-waffle stare. Chrissy nodded and downed her Diet Coke in a few gulps. He wondered what would happen if he abandoned all of them. They looked like people in a bad movie about ordinary people. When the waffles arrived, Kanye pooled the syrup and ate with abandon. Against John's cheek Chrissy whispered, "every house should be a Waffle House"
John and Chrissy danced to their song, John's "Ordinary People." Nobody bothered them. They ate. They had fun. Danny Caine's work has appeared in Mid-American Review, Atticus Review, New Ohio Review, Minnesota Review, and other places. He hails from Cleveland and is an MFA canidate at the University of Kansas. He works The Raven Bookstore in Lawrence, and serves as managing editor for Beecher's.